Is there a place for you in God's kingdom? Are you wondering how God fits into your own life? What kind of love could God have for me? Deanna Nowadick takes a look at the fruits of the spirit in Galatians, each fruit chapter by chapter. She puts her own stories and experiences from her childhood to present and shows how God is working out these character traits in her own life. She is witty and fun and you will read this book like you are talking with an old friend. 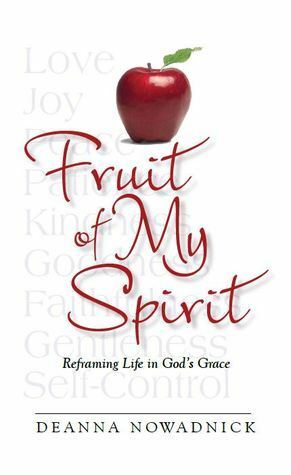 In some ways it can almost be an autobiography, but Deanna just shares the stories that have shaped her life, and the ones she can reflect on as a fruit of the spirit. She would be a fun lady to sit down with over coffee! I loved reading about her 'story' and how she is now able to see God at work in those area of her life. Deanna uses quotes from hymns, at the end of each chapter, to bring around the spirit of the Lord in fruit of the spirit. By reframing her past with what God has planned, Deanna encourages us to see that God has always been there and continues to fulfill His promises. Melanie, thank you for your kind words and beautiful review. Yes, God has always been there--for each one of us--and continues to fulfill His promises. May He continue to bless and keep you and your followers!